Most of us love to watch high-definition videos on big screens and even on small screen mobile devices. But a high-definition video might consume too much of space on your device. And if you try to compress it into other formats, there might be a loss in the quality of video. Don’t worry. You can convert MP4 to H.264 file format to get the same quality as it was before. Most importantly, you can save large space that the MP4 video might consume by converting it into H.264 file format without losing the quality. Now the question here is how to convert MP4 videos into H.264 file format? Since the Internet is flooded with plenty of choices, and you can find so many tools for the same purpose claiming to be the best. So which one should you select? Here we will recommend one of best video converter - Joyoshare Video Converter. Joyoshare Video Converter is a trusted tool that can convert nearly 150+ file formats into enviable output formats without any hassle. The conversion can be done at 30X faster speed, so that you can easily get the file formats you want. Besides, you can also edit your video before converting it, such as, adding some subtitles, watermarks or adjusting the brightness and contrast, etc. What's more, the converter supports large number of audio and video formats, such as MP4, M4V, MKV, MOV, HEVC Video, HEVC MKV, WMA and more. Let us learn how Joyoshare helps in converting a MP4 video into H.264 video format under the following instructions. Download and install Joyoshare Video Converter Software on your Windows device. Open the video converter tool. Add the MP4 file(s) to the software interface by clicking the ‘Add Files’ option, or just drag the files to the center to start. You can even add multiple files for batch conversion. Once the files have been uploaded successfully, still you need to select MP4 as the output format. Click the ‘Gear’ icon which is located at the top-right corner and and set the H.264 as the codec. 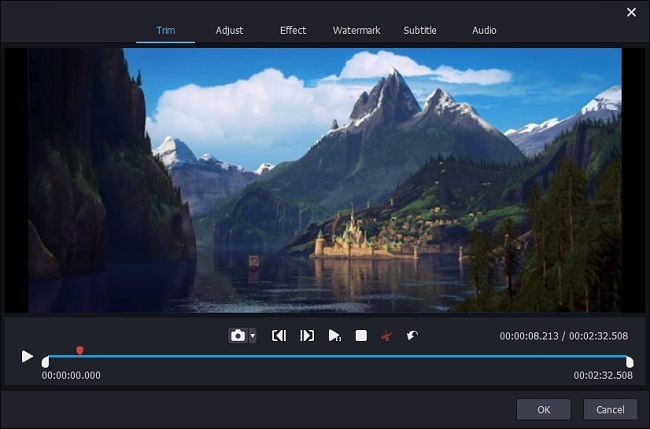 Before starting to convert the MP4 to H.264, users can also edit the video effects like setting the contrast, adding the watermarks and subtitles etc. Once the settings have been customized, you are all set to start the conversion process. Click the 'Convert' button to start the conversion. The conversion might take few moments depending upon the size of the video. MPEG-4 or MP4 is a popular digital multimedia container format which has been developed by the International Organization for Standardization. This format is generally used to store audio and video, but can even be used for storing the subtitles. It also allows streaming on the web like most of the container file formats. A number of portable media players are advertised as the MP4 players. H.264 is also called as MPEG-4 Part 10 , which is created to supersede the MPEG-2 to maintain the video quality and keep the bitrate down. This makes the H.264 format better for portable devices. In some cases, the bitrate can be achieved as low as 50%. It is often used for streaming the videos and Blu-Ray movies because H.264 can deliver a great video quality as well as low bitrates. This means that the video will be comparatively smaller in size and better in quality. But, to process these files, you must have reliable video accelerators like Joyoshare. 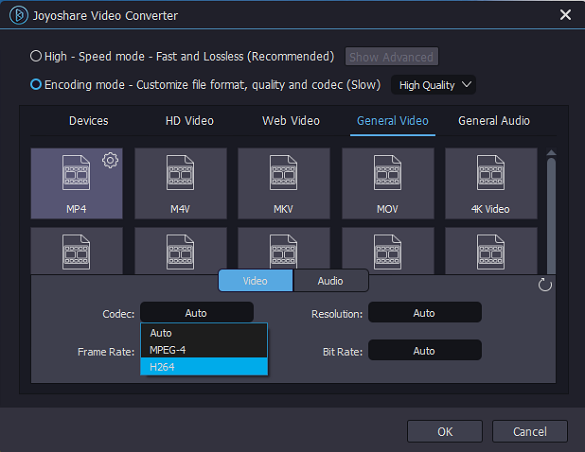 Now you know how easily it is to convert MP4 to H.264 with Joyoshare Video Converter. If you are looking for a reliable video converter, there is no better option than Joyoshare. Go for it now and convert your favorite videos into 150+ output formats at a go.